a private paradise for two. . . This cabin is located in Octavia, Oklahoma in the valley below the Kiamichi Mountain range in southeast Oklahoma. It is the only mountain range in the United States that runs west to east. This is a very beautiful rural area, sparsley populated by most standards. Very scenic drives within a short distance. Such as the Talimena Scenic Byway (also known as Skyline Drive) that is within 20 minutes from the cabin. Also Broken Bow Lake/Beavers Bend State Park is just 35 minutes to the south. Mountain Fork River is just a short 9 mile drive to the south of the cabin. Lots of good fishing there. Honobia (Home of the Bigfoot Festival) and Three Rivers Wildlife Management Area is only 8 miles west. All this for under $200 per night. There are a few cafes and convenience stores as well as a new Dollar General within a few miles so our guests may purchase items they may need for their stay, but we encourage them to bring any major items (such as meat or other groceries) with them. Also we regret that we can no longer provide firewood free of charge for the fire ring. We can provide it for a extra fee. Please ask when reserving. The cabin is on a hill surrounded by native trees but the mountains to the north can be seen through peeks of the foliage. Two person hot tub on the deck along with a gas grill and table set is the perfect setting for watching the deer graze around the cabin. Also a fire ring and glider, table and chairs in the front of the cabin can be a relaxing place to enjoy a cool evening. Night time at the cabin is a romantic time to spend in the hot tub under the stars, listening to the lonesome cries of the coyotes in the distance and the romantic calls of the whippoorwills. 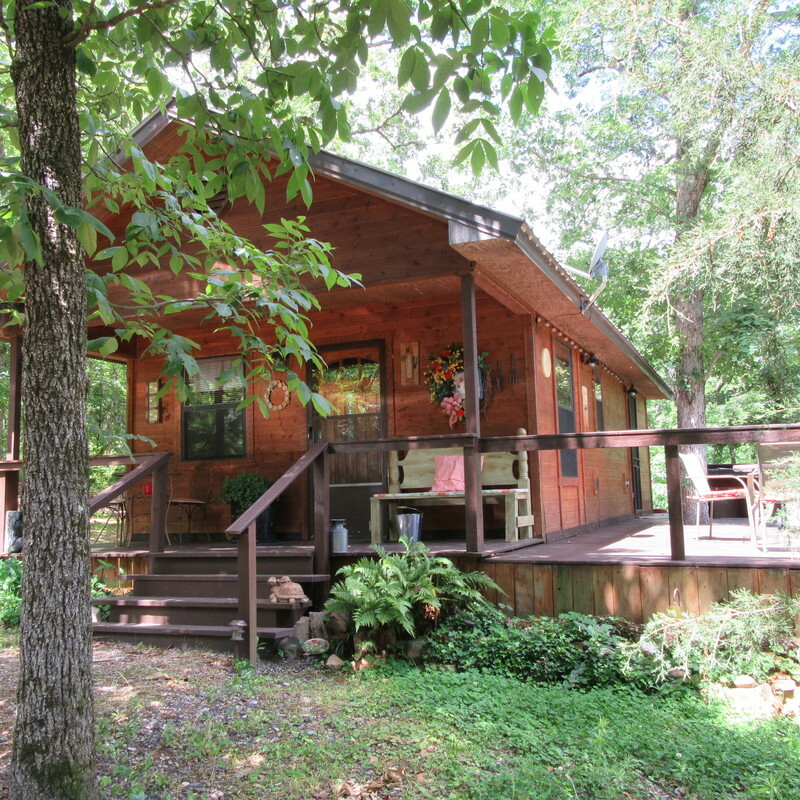 You won't find a more beautiful place to spend some together time than here at Little Eagle Creek Cabin. We provide all towels and linens, fully stocked kitchen with pots, pans etc, coffee, basic spices including salt/pepper, paper towels, and toilet tissue, kleenex, soaps and lotions, toothbrushes/paste. All for your comfort while enjoying a private vacation. If we don't have it we will get it. This cabin is all you need for a romantic getaway. Call and make a reservation today.